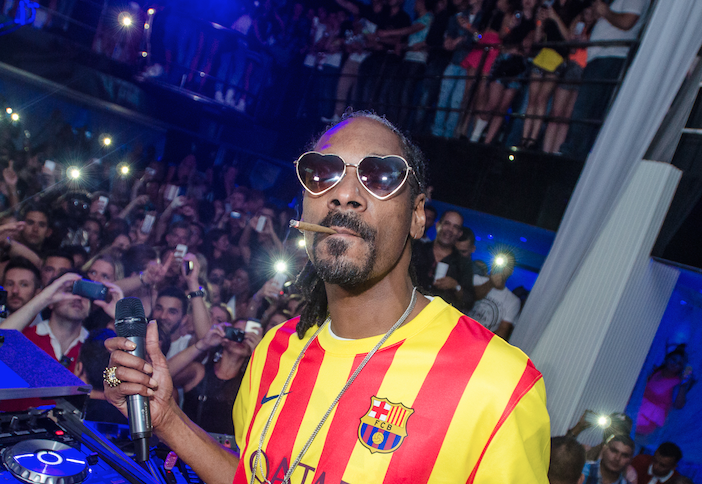 Snoop Dogg played a DJ set in Sleek Nightclub in Puerto Banus on the 7 August. Calvin Cordozar Broadus, Jr. (born October 20, 1971), known by his stage names Snoop Doggy Dogg,Snoop Dogg, and later Snoop Lion, is an American rapper, singer-songwriter, and actor. Snoop has sold over 30 million albums worldwide. His music career began in 1992 when he was discovered by Dr. Dre. He collaborated on Dre's solo debut The Chronic (1992), and on the theme song to the feature film Deep Cover. After leaving Death Row, Snoop signed with No Limit Records, where he recorded his next three albums. Da Game Is to Be Sold, Not to Be Told (1998), No Limit Top Dogg (1999), and Tha Last Meal (2000). Snoop then signed with Priority/Capitol/EMI Records in 2002, where he released Paid tha Cost to Be da Boss. He then signed with Geffen Records in 2004 for his next three albums R&G (Rhythm & Gangsta): The Masterpiece,Tha Blue Carpet Treatment, and Ego Trippin'. Malice 'n Wonderland (2009) and Doggumentary (2011), were released on Priority. Snoop Dogg has starred in motion pictures and hosted several television shows including, Doggy Fizzle Televizzle, Snoop Dogg's Father Hood, and Dogg After Dark. He also coaches a youth football league and high school football team. In September 2009, Snoop was hired by EMI as the chairman of a reactivated Priority Records.